Alchemists are proficient with all simple weapons and bombs. They are also proficient with light armor, but not with shields. If I make an extract of a multiple-choice spell (such as protection from energy), do I make that choice when I create the extract, or when I drink it? You make the choice when you drink it. Can I use the infusion discovery to create an infused extract of a personal-range formula (such as true strike), which someone else can drink? Yes, you can. The design team may decide to close this loophole in the next printing of the Advanced Player’s Guide. If an alchemist has the Fast bombs discovery, can he use Rapid Shot, Two-Weapon Fighting, Improved Two-Weapon Fighting, haste, and similar abilities and effects to add more attacks? 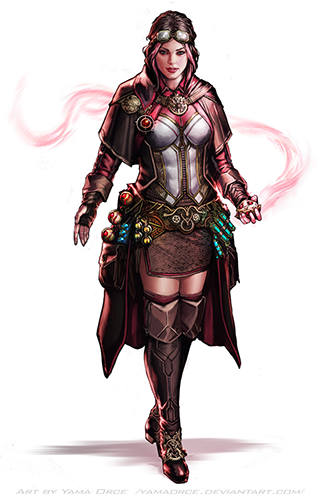 Does the Accelerated Drinker feat allow a character to drink an alchemist extract as a move action? Does the damage bonus from the Point Blank Shot feat apply to bombs? Does an inferno bomb, poison bomb, smoke bomb, or stink bomb cause bomb damage in addition to the special effect listed for those discoveries? Yes. For example, a smoke bomb deals bomb damage and creates an area of smoke. For the purposes of an alchemist’s class abilities, are poisons considered alchemical items? Is an alchemist a spellcaster for the purpose of crafting magic items other than potions? As written, no, alchemists are not spellcasters, and therefore can’t select feats such as Craft Wondrous Item. The design team is aware that this creates some thematic problems with the idea of an alchemist creating golems and so on, and plan to examine this in the future. What kind of action is it to use an extract, mutagen, or throw a bomb? It is a standard action to use an extract, mutagen, or throw a bomb. This action includes retrieving the necessary materials from the alchemist’s supplies, in the same manner as retrieving a material component is included in the act of spellcasting. Alchemists are not only masters of creating mundane alchemical substances such as alchemist’s fire and smokesticks, but also of fashioning magical potion-like extracts in which they can store spell effects. In effect, an alchemist prepares his spells by mixing ingredients into a number of extracts, and then “casts” his spells by drinking the extract. When an alchemist creates an extract or bomb, he infuses the concoction with a tiny fraction of his own magical power—this enables the creation of powerful effects, but also binds the effects to the creator. When using Craft (alchemy) to create an alchemical item, an alchemist gains a competence bonus equal to his class level on the Craft (alchemy) check. In addition, an alchemist can use Craft (alchemy) to identify potions as if using detect magic. He must hold the potion for 1 round to make such a check. An alchemist can create only a certain number of extracts of each level per day. His base daily allotment of extracts is given on Table: Alchemist. In addition, he receives bonus extracts per day if he has a high Intelligence score, in the same way a wizard receives bonus spells per day. When an alchemist mixes an extract, he infuses the chemicals and reagents in the extract with magic siphoned from his own magical aura. An extract immediately becomes inert if it leaves the alchemist’s possession, reactivating as soon as it returns to his keeping—an alchemist cannot normally pass out his extracts for allies to use (but see the “infusion” discovery below). An extract, once created, remains potent for 1 day before becoming inert, so an alchemist must re-prepare his extracts every day. Mixing an extract takes 1 minute of work—most alchemists prepare many extracts at the start of the day or just before going on an adventure, but it’s not uncommon for an alchemist to keep some (or even all) of his daily extract slots open so that he can prepare extracts in the field as needed. Although the alchemist doesn’t actually cast spells, he does have a formulae list that determines what extracts he can create. An alchemist can utilize spell-trigger items if the spell appears on his formulae list, but not spell-completion items (unless he uses Use Magic Device to do so). An extract is “cast” by drinking it, as if imbibing a potion—the effects of an extract exactly duplicate the spell upon which its formula is based, save that the spell always affects only the drinking alchemist. The alchemist uses his level as the caster level to determine any effect based on caster level. Creating extracts consumes raw materials, but the cost of these materials is insignificant—comparable to the valueless material components of most spells. If a spell normally has a costly material component, that component is expended during the consumption of that particular extract. Extracts cannot be made from spells that have focus requirements (alchemist extracts that duplicate divine spells never have a divine focus requirement). An alchemist can prepare an extract of any formula he knows. To learn or use an extract, an alchemist must have an Intelligence score equal to at least 10 + the extract’s level. The Difficulty Class for a saving throw against an alchemist’s extract is 10 + the extract level + the alchemist’s Intelligence modifier. An alchemist may know any number of formulae. He stores his formulae in a special tome called a formula book. He must refer to this book whenever he prepares an extract but not when he consumes it. An alchemist begins play with two 1st level formulae of his choice, plus a number of additional forumlae equal to his Intelligence modifier. At each new alchemist level, he gains one new formula of any level that he can create. An alchemist can also add formulae to his book just like a wizard adds spells to his spellbook, using the same costs and time requirements. An alchemist can study a wizard’s spellbook to learn any formula that is equivalent to a spell the spellbook contains. A wizard, however, cannot learn spells from a formula book. An alchemist does not need to decipher arcane writings before copying them. In addition to magical extracts, alchemists are adept at swiftly mixing various volatile chemicals and infusing them with their magical reserves to create powerful bombs that they can hurl at their enemies. An alchemist can use a number of bombs each day equal to his class level + his Intelligence modifier. Bombs are unstable, and if not used in the round they are created, they degrade and become inert—their method of creation prevents large volumes of explosive material from being created and stored. In order to create a bomb, the alchemist must use a small vial containing an ounce of liquid catalyst—the alchemist can create this liquid catalyst from small amounts of chemicals from an alchemy lab, and these supplies can be readily refilled in the same manner as a spellcaster’s component pouch. Most alchemists create a number of catalyst vials at the start of the day equal to the total number of bombs they can create in that day—once created, a catalyst vial remains usable by the alchemist for years. At 1st level, an alchemist discovers how to create a mutagen that he can imbibe in order to heighten his physical prowess at the cost of his personality. It takes 1 hour to brew a dose of mutagen, and once brewed, it remains potent until used. An alchemist can only maintain one dose of mutagen at a time—if he brews a second dose, any existing mutagen becomes inert. As with an extract or bomb, a mutagen that is not in an alchemist’s possession becomes inert until an alchemist picks it up again. All alchemists gain the Throw Anything feat as a bonus feat at 1st level. An alchemist adds his Intelligence modifier to damage done with splash weapons, including the splash damage if any. This bonus damage is already included in the bomb class feature. At 2nd level, and then again every 2 levels thereafter (up to 18th level), an alchemist makes an incredible alchemical discovery. Unless otherwise noted, an alchemist cannot select an individual discovery more than once. Some discoveries can only be made if the alchemist has met certain prerequisites first, such as uncovering other discoveries. Discoveries that modify bombs that are marked with an asterisk (*) do not stack. Only one such discovery can be applied to an individual bomb. The DC of any saving throw called for by a discovery is equal to 10 + 1/2 the alchemist’s level + the alchemist’s Intelligence modifier. At 18th level, an alchemist can create alchemical items with almost supernatural speed. He can create any alchemical item as a full-round action if he succeeds at the Craft (alchemy) check and has the appropriate resources at hand to fund the creation. He can apply poison to a weapon as an immediate action. At 20th level, the alchemist makes a grand discovery. He immediately learns two normal discoveries, but also learns a third discovery chosen from the linked list below, representing a truly astounding alchemical breakthrough of significant import. For many alchemists, the promise of one of these grand discoveries is the primary goal of their experiments and hard work. The spontaneous alchemy rules allow any characters to dedicate themselves to the art of spontaneous alchemy. Feats that increase one’s prowess in spontaneous alchemy make this path even more potent, allowing both professional and amateur alchemists to craft dozens of different alchemical items in a fraction of the time that would normally be required. These optional spontaneous alchemy rules provides an all-new way for characters to rapidly craft alchemical items. This subsystem requires the player to track the individual alchemical reagents her character has on hand, which she can combine in a variety of ways using different processes to create a wide selection of alchemical items. With the GM’s permission, characters with the Eschew Materials feat can assume they have the correct reagents on hand to perform spontaneous alchemy; instead of tracking the quantities of each reagent owned, players can then simply track the number of gold pieces worth of reagents their PCs spend each time they perform an act of spontaneous alchemy. The cost to craft an item with spontaneous alchemy is usually 10% to 20% higher than the item’s market price. To perform spontaneous alchemy, a character must begin with the reagents and crafting tools required by the recipe of the item she wants to make. The reagents, crafting tools, and length of time required are noted in the recipe. Once the necessary time has passed, the creator attempts a Craft (alchemy) check against the DC to craft the item. If she succeeds, she completes the item. If the creator’s check fails, however, she risks a mishap (see Mishaps). Each alchemical process requires a certain length of time, and might require one or more alchemical crafting tools. The length of time and the crafting tools required to craft certain alchemical items might sometimes differ from these baselines. Instead of receiving an additional skill rank or hit point whenever they gain a level in a favored class, some races have the option of choosing from a number of other bonuses, depending upon their favored classes. The following options are available to the listed race who have alchemist as their favored class, and unless otherwise stated, the bonus applies each time you select the listed favored class reward.